Commercial Sheep Farmers have a unique opportunity to look at more profitable sheep production when the UK’s first New Zealand Suffolk Sheep open day takes place in Shropshire on Saturday 12th July. Host Robyn Hulme explains that the family ‘ram breeding’ business is based solely on providing commercial sheep farmers with the appropriate tools to enable them to reduce their production costs and to increase their profits. 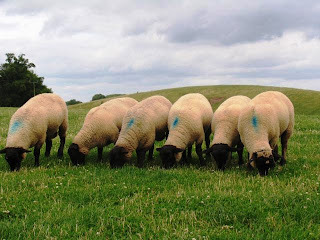 current difficulties of UK sheep farmers have already been explained by NZ farmers who were forced to breed sheep that required minimum labour input and had maximum disease resistance. Today in NZ one person is able to look after a minimum of 3000 ewes and their lambs. English born ROSEMARY HAMILTON, who, with her NZ husband, has been running 6,500 ewes on the South Island. ROBIN FAGAN is also a NZ farmer who also owns NZ’s leading sheep and cattle handling equipment – Racewell. Sheep veterinary specialist HARRIET FULLER.